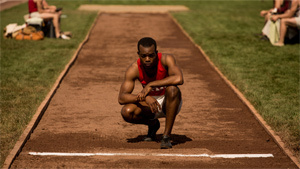 Despite a strong performance from Stephan James as Jesse Owens, Race proves an only passable account of the track star’s life — from Owens’ victories as a student athlete at Ohio State to his stunning triumphs at the 1936 Berlin Olympics. A sprinter and long jumper by trade, Owens won four gold medals in Berlin, a feat that was widely celebrated as a slap in the face to Hitler and his Nazi minions, racists who hoped to use the games as a demonstration of unbeatable Aryan superiority. Director Stephen Hopkins’ dutifully tells Owens’ story — or at least parts of it — but he’s so busy recounting events that he doesn’t get deep enough into anything. None of this is to say that Race, with its double-edged title, is an act of hagiography. Owens is shown making mistakes, notably an affair he had while he was engaged. And some of the movie’s supporting players are also depicted as flawed. Avery Brundage (Jeremy Irons), an influential member of the International Olympic Committee in 1936 and later its head, was a construction mogul whose dealings with the Nazi government sparked controversy. Brundage wouldn’t listen to progressive voices who insisted that this particular Olympics should be boycotted. The movie also shows that Larry Snyder (Jason Sudeikis), Owens’ tough-love coach at Ohio State, wrestles with alcohol problems, and, at times, seems insensitive to Owens’ problems. The movie takes a pretty positive view of Leni Riefenstahl (Carice van Houtem), the filmmaker whose Olympia set new standards for sports photography. Of course, Riefenstahl also made Triumph of the Will, a propaganda documentary and near exaltation that chronicled the massive 1934 Nazi rally in Nuremberg. Here, Riefenstahl is portrayed as a rebellious spirit, defying Joseph Goebbels (Barnaby Metschurat) so that she could make her own film rather than the one that the propaganda minister wished to see. Those who know little or nothing about Owens’ life can view Race as a learning experience, but even the racial barriers in a script from Joe Shrapnel and Anna Waterhouse can feel as if they’re being played by the numbers, including the virulent racism Owens faced at Ohio State, where he broke three world records at a now legendary 1935 Big Ten meet in Michigan. A recent New York Times story briefly describes Owens’ life after the Olympics. He made an unsuccessful foray into Hollywood, dabbled in vaudeville, and, at one point, lost his amateur status, the article notes. Desperate to support his family, he toiled at gas stations, and performed stunts in which he ran against race horses. American racism kept Owens from capitalizing on his victories in Berlin. His triumphs abroad, presented here with the expected celebratory quality, didn’t do much to change the racial climate at home, something the movie could (and should) have done more to dramatize. Odd isn’t it? When it comes to fictionalized sports movies Hollywood has no trouble serving up inspiration, but when it latches on to a historically important story, it can’t get beyond an effort we’ll call "adequate," and perhaps instructional for those unfamiliar with Owens’ life. Given all its volatile and exhilarating ingredients, it’s disappointing that Race doesn’t have greater impact.